The Deaf Institute is one of the best music venues, except if you’re a music photographer that is! ; This is when things start to get quite challenging! With that being said, I have seen some great bands there over the last 12 Months. The Amazons, Circa Waves and Dream Wife are a few that immediately come to mind, so it is safe to say that Sunset Sons had big shoes to fill. With The Deaf Institute stage completely bathed in red light for the whole show, the first band on were Sunset Sons’ label mates Vistas. 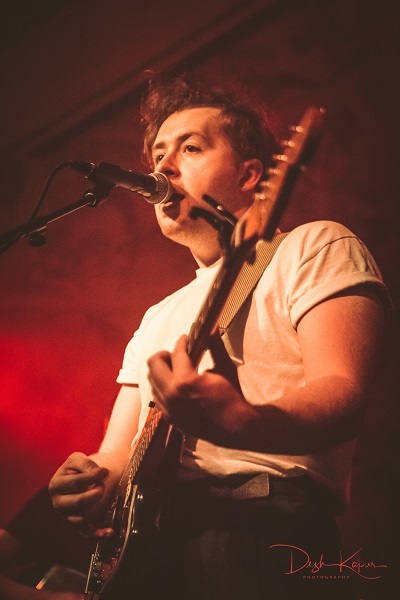 Hailing from Edinburgh, and widely regarded as one of Scotland's most promising new bands, their single "Retrospect" has over 1 million hits on Spotify as I write. They play, what I would describe as, finely crafted breezy-indie pop, reminding me of Two Door Cinema Club, Franz Ferdinand and Bloc Party. This isn't to say that they sound like those bands as they had their own sound and style, jangly guitars sitting with breezy synths, over beautifully sugary sweet melodies. Lead singer Prentice Robertson has a voice that is just perfect for the songs they write. Unfortunately, I couldn't get a setlist so naming the songs is out of the question, but I really liked this band and pretty much all of the songs they played. Vistas are definitely a band to watch and I would say if you get a chance to see them definitely go!! So, it was time for the main course. To be honest, I hadn’t really heard much of Sunset Sons’ music, a four-piece consisting of guitar, bass, drums and keyboards. I knew that they were very popular on the Surf Scene but I didn't know what to expect and what I got was very impressive and I am now definitely a bit of a fan. As I looked around the sold-out Deaf Institute, I was quite surprised that the age group was right across the spectrum. Young surfers, indie kids and middle-aged fans were all gathered here to see the Sunset Sons do their thing, a brilliant blend of guitar and keyboard inspired surf blues and indie rock. Even though the band have had a 2-year hiatus since their last recordings, you wouldn't have thought so. 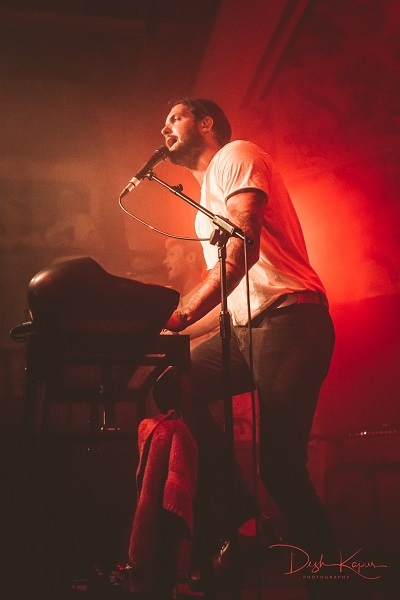 They were tight and full of energy as they prowled and jumped across the stage with lead singer Rory Williams switching between caressing the keys on his keyboard to smashing down on them, then flailing widely with a tambourine. Rory's voice is rich and bluesy, not unlike early Kings Of Leon frontman Caleb Followill. It would be quite an easy thing to say that they were reminiscent of other British surf bands like Reef, but that would be doing them an injustice. I thought that they were better and had a beautifully balanced array of songs that ranged from those that packed more punch and melody, amidst quieter and more mellow songs which allowed Rory' s voice to croon and caress the crowd who then sang them right back to him. After a set packed with great songs and the crowd dancing, singing and stomping along, the night was over and as the venue slowly emptied and I made my way back to my car, I thought to myself, one of the reasons I love being a gig photographer is because every now and then you come across a band that you have missed, and they make you smile and remember why you loved music in the first place. Keep on keeping on guys and may all your waves be huge ones.